Does our world seem different to you? It does to me. Life and ministry in today's new culture is different. While times change throughout one's life, our world has changed dramatically just in the last 20 years or so…not to mention the last five years. This puts us in quite the challenging position at this point in history. As Gutenbergers we have been greatly influenced by the core aspects of the Gutenberg Era, a 500 year-long era which no longer exists. You and I have awakened in a new culture, yet we did not have the transition period we would if we had intentionally packed up and moved to another culture. Since we cannot turn back the clock and return to our known era and culture, it is important and necessary for us to learn our new culture so we can more effectively communicate our core Christian beliefs and make a positive impact on this new world in which we live, work, minister, and play. 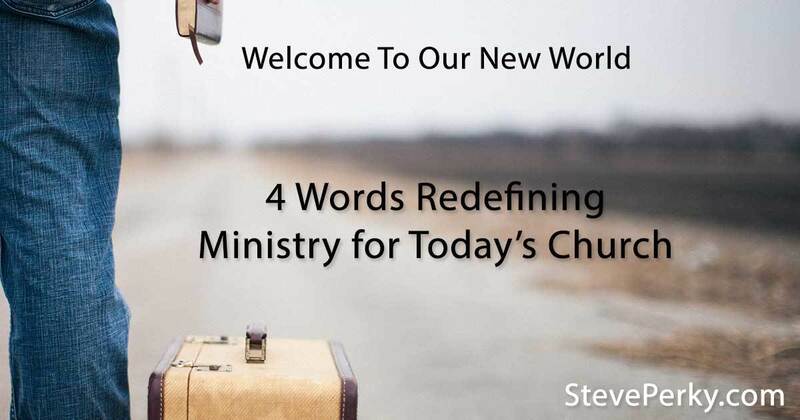 There are at least four major words/concepts that have been dramatically redefined in our new culture. Understanding these will help with cross-culture communication with the first generation citizens (Gen Y or Millennials), the second generation citizens (Gen Z), and those who have immigrated from the Gutenberg Era to this new world. There is still only a finite amount of time. That has not changed, but we now intentionally and even unconsciously time-shift throughout our day. The following list is a sample of the influences on how we time-shift. Communication, consumption of content, and interaction with others now takes place on our terms. We do it when we want instead of at the time of broadcast. People have fewer close friends these days despite being well-connected on social media through a “network of relationships.” Even in the offline world, we attend networking events to find contacts for the purpose of expanding our network of influence and opportunity. This connection makes it easy to call upon our networks to assist and has led to concepts like crowd sourcing. From a church standpoint, one advantage to this is being able to quickly rally people to pray for a person or situation. These requests can spread more quickly and reach further around the globe that ever in human history. So we are able to be a part of something bigger, but we are losing the deeper connections of close friendship. It is impossible to physically be in more than one location. We can, however, be physically in one location and attend a meeting via telephone or video that is occurring in another location. This has expanded our concept of place. Because we can now actively participate via technology, people can be in a remote location and function within another. The new media is the new neighborhood. The internet plays a special role for networked individuals because it is a participatory medium. No longer does technology limit us to consuming what is happening on the other side of the screen. We can now participate with others who are also remotely connected to the event as well as participate with those who are physically in the location of the event. As a result of our place being redefined, our presence in our new place is redefined. In the past there were only three possible levels of Presence. There are now four levels of Presence in our new world. As a result, measuring church attendance alone is an incomplete metric of the dedication of people in our church. In fact, the definition of “attendance” has changed whether the Church likes it or not. The lower left quadrant represents those who are not present physically or mentally. These individuals are completely disengaged with our community or event. The bottom right quadrant represents individuals who are physically in the room at our event. However, for whatever reason they are mentally absent. They could have the weight of the world on their shoulders and be mentally present elsewhere. They could be reading a book during worship service, playing on their electronic devices, or sleeping. These individuals are marginally, if at all, engaged. However, they are counted as “present” in our attendance numbers and give us a false sense of engagement at church events. The upper left quadrant is the new one that today's culture is embracing more and more. These are individuals who are not physically present at our event. However, they are connected via a digital channel. This can be live or on demand. However, they are mentally present with the content/sermon being presented. Since they are not physically present, we hesitate to count them “present.” There is no standard or simple way to measure how many are engaged, but many are truly engaged and consider themselves present at our event. The upper right quadrant represents individuals who are mentally/emotionally present as well as physically present. They are fully engaged. 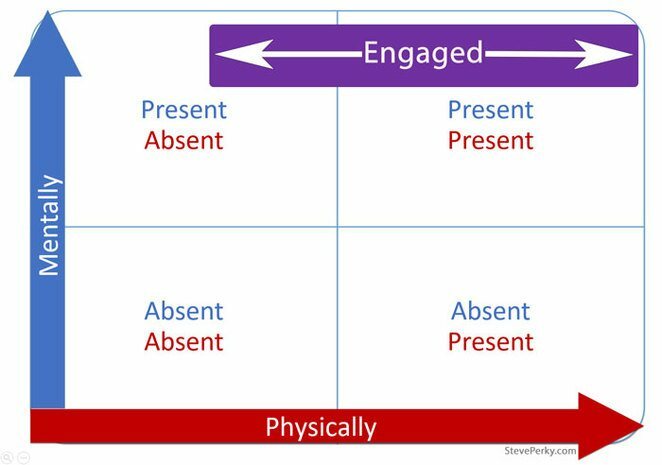 This is the ultimate level of engagement, but it is not always possible for everyone to be in this quadrant each week or at every event. We need to focus more on engagement than presence. More on that below. There are 168 hours in each week. It used to be that people came to a church building at least one hour each week. The act of physically coming to the church building has reduced to more like one hour every few weeks. As the lower right quadrant of the graph above indicates, just because a person comes to the church building does not mean they are engaged. As we look at engagement, take a look at the video below. Whether it is an Apple iPad Pro, Microsoft Surface, Amazon Alexa, Google Home, smart phone, or other device, the daily life of people in our culture is becoming more time and place independent to the point it greatly affects how we connect with and relate to people in our own place. We are quickly entering a time when the lines between online and offline are so blurry that we, too, will ask the question, “What is a computer?” The technology will be so ubiquitous in our daily lives that we won't realize our constant moving on and offline. We are always in our place, and our place is where our connectivity is. While this tweet is meant more for one's digital/Internet connection, this also still applies to emotional connection. We place a lot of our Church resources into getting people to attend worship services. Don't get me wrong. Worship services are very important. The great teaching and preaching is a form of content in people's lives. We need this great content to inspire, teach, and disciple people. Often we look at Church as being synonymous with the Sunday morning worship service. We see this as a destination instead of a part of the journey to deeper relationship with God. Our God made us for relationship; relationship with Him and relationship with others. There is a concept in digital marketing that says, “People come for the content, but they stay for the connection.” This is more true today than ever before. How do we as the Church foster connections with and between people during the 167 hours beyond Sunday morning? We, the Church, need to use the available technology to reach into the lives of people to break that social isolation and walk with them into strong online and offline relationships where they are engaged in community. Connected people are more engaged. This applies both in the Church building and out. Whether it is the home bound, college students, military, hospitalized, or those who have to work on Sundays, people have an opportunity to more fully engage. By looking at the Google Analytics of our online streaming, we can extend our physical places to where groupings of people are engaging with our church. Whether this means starting online Bible studies, new in person Bible studies, launching new campuses, planting churches, or implementing a micro-campus movement where people open their homes as small campuses/sites for your church to reach their neighborhoods, it is possible for the Church to BE the Church today more than ever. As the “C” Church, we need to embrace the possibilities we now have to make disciples “as we go” rather than requiring people to be physically located in a building at a given day and time of the week. What ideas do you have for the Church to be present and engaged in daily life? I look forward to your thoughts in the comment section below.